Beetles can cause great damage to your plum trees resulting in significant fruit losses. Control is a necessary part of plum tree care. Even though healthy trees can avoid infestation, treatment is imperative when a problem occurs. Empower yourself in the home garden by identifying what to look for and creating a control program for vigorous trees. 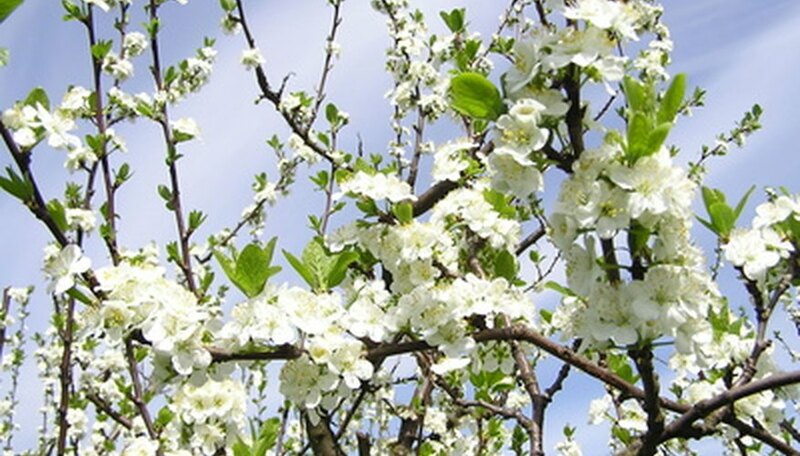 Vigorous plum trees are more likely to avoid or fight off pest infestations than weakened trees. Grow your plum trees in locations that provide a day of full sun exposure. Full sun during morning hours is most important as it aids in the drying of dew that invites diseases that weaken plants, according to the AgriLife Extension Texas A&M System. Plum trees thrive in moist, well-drained soil. Avoid waterlogged soil that decreases the plum tree's ability to absorb water and nutrients, resulting in quick decline. Plum curculios (Conotrachelus nenuphar) are beetles that infest plum trees among other fruit trees like apples and cherries, according to the Ohio State University Extension. Larvae are very small with brown-hued heads and yellow-white bodies that lack legs. Adult beetles have elongated faces in white and orange with black bodies and ridged wings; total body length measures approximately 2/10 inch. Both larvae and adults are the injury culprits. Adult beetles feed during the spring after locating a host plant, and female adult beetles create crescent-shaped incisions in fruit where they deposit eggs, according to the Ohio State University Extension. Larvae hatch and feed on fruit, working their way around the fruit's pit until reaching maturity and exiting. Look for the crescent scars from egg deposits in fruit, early fruit drop, and malformed fruit that results from the beetle infestation, according to the Michigan State University Extension. Appropriate control will help rid your garden of this problem. For natural control of beetles on plum trees, place a light-colored fabric or a bucket of soapy water beneath the tree and tap the branches. Beetles will fall from the plum tree to their death in the soap and water solution, or you may dispose of them after collection in a sheet. Additionally, remove and destroy fallen fruit and other affected plant parts to prevent the growth of larvae and the spread of infestation, according to the Ohio State University Extension. For a chemical control method of plum curculios, once three-quarters of the petals have fallen from your plum tree, apply an insecticide with the active ingredient malathion or carbaryl. The use of an insecticide on your plum tree will reduce the population of beetles, according to the Texas Cooperative Extension.